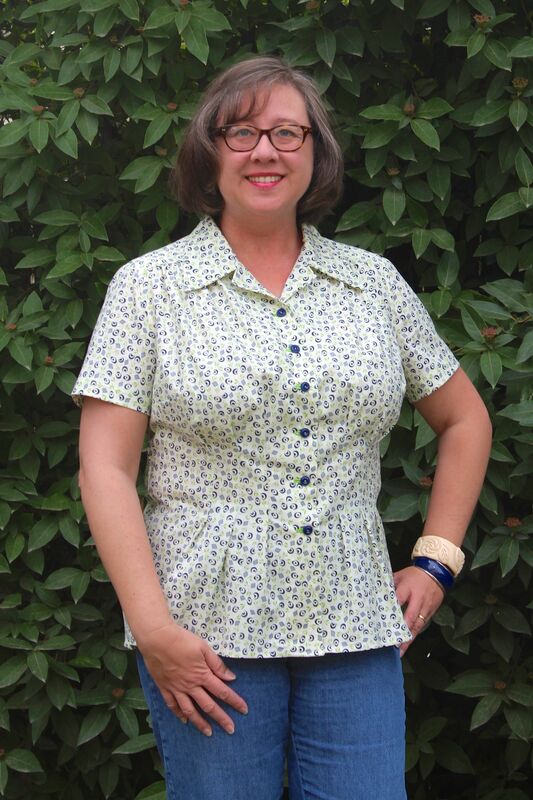 For my latest project, I started off with dress pattern Butterick 5846 and turned it into a blouse. I love how this blouse came out, particularly since I my last attempt at a project had a sad ending. This is a quilting cotton, so it’s a little heavy for a blouse, but it’s soft. I love-love-love the colors. 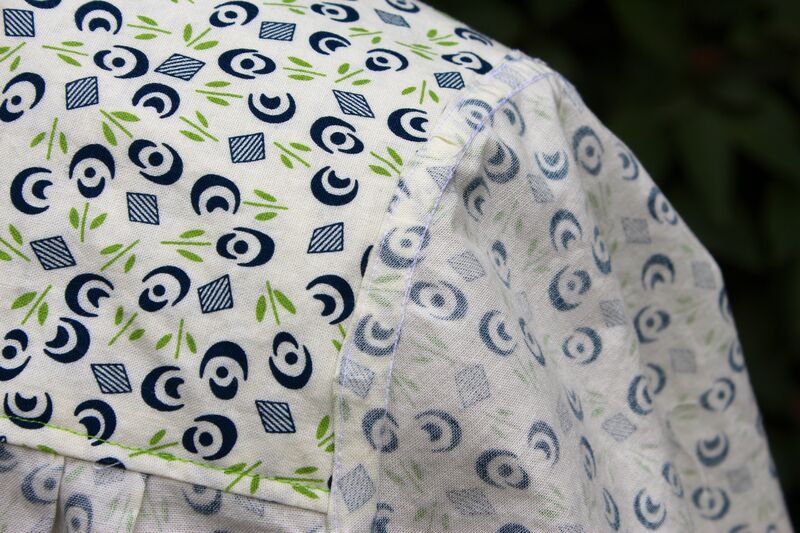 The pattern calls for top-stitching all over the place, which I liked. The vintage buttons are fun and a good match. I originally had this darker green thread selected for the top-stitching, but as you can see, I ended up going with a bright yellow-green instead. I made the bodice longer. The bodice originally ended at the waist seam with a total of 12 tucks into that seam. I extended the tucks an inch (the better to hide behind a waistband) and increased the bodice length about 9 inches. I changed the gathered sleeves to regular set-in sleeves. Gathered sleeves are not the best look on me. I liked the sleeves on New Look 0134, which I had recently made, so I wanted to substitute those. 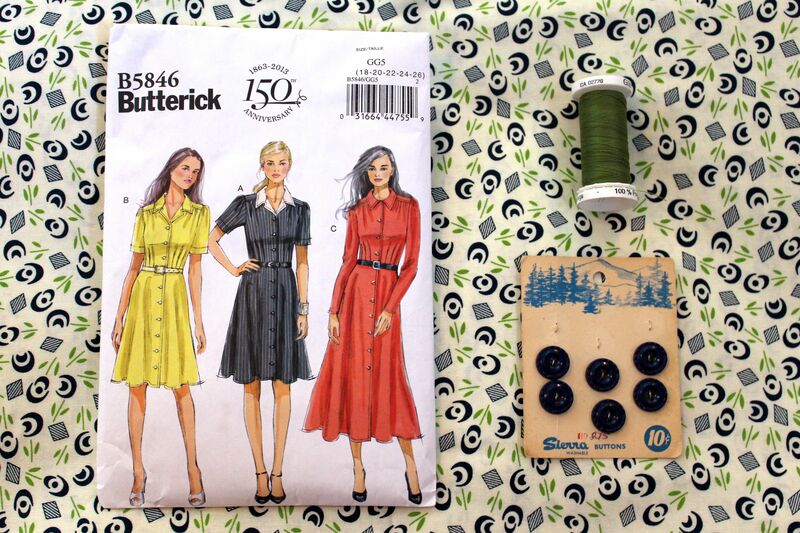 I measured the armhole sleeve seam on New Look 0134, and it was a perfect match for Butterick 5846. Once I eased them, the sleeves went in beautifully. Love them. I made the collar a little larger to better reflect vintage styles. Vintage blouses tend to have bigger collars than today’s blouses. I made a line bisecting the point of the collar, then drew a new point an inch out from the original one. I then blended the lines into the original collar where it joined the neckline and at the shoulder. It’s a subtle change, but it gives me confidence that I can do pretty much anything I want with a collar shape. I turned the two-piece yoke into a single yoke. I couldn’t figure out why the yoke had a seam at the shoulder — until I was tracing it to make it a single piece. If it’s done in a plaid or a stripe, the lines on the front part of the yoke will be at a weird angle. That didn’t affect this print, and I was already tracing, so I continued on and made the yoke one piece. It was a simple matter of overlapping the shoulder seamlines and tracing. I still don’t want to deal with my serger (which probably only needs to be serviced), so I am all about tidy seam finishes that don’t require one. 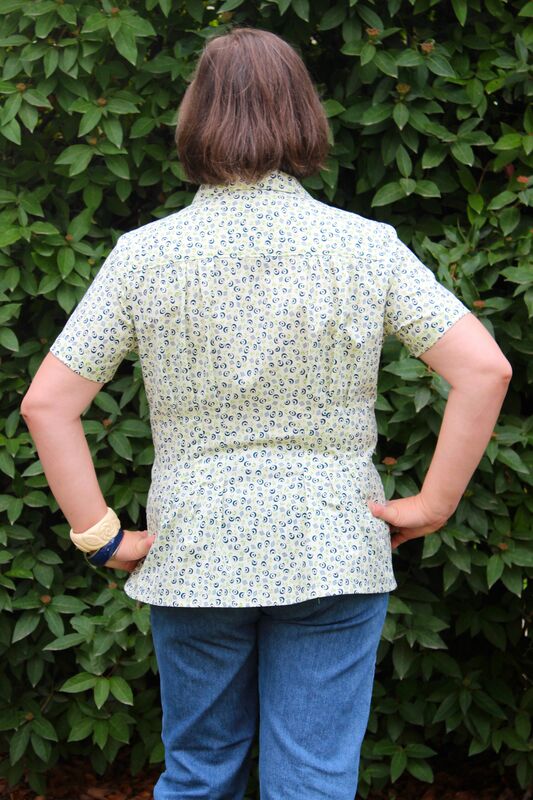 Since I practiced flat-felled seams on my recent ill-fated project, I used them all over this blouse. I love the way they look. How slick are these flat-felled seams? They were a little tricky here at the armhole seam, but I made them work. For the yoke, I used a technique I’ve been reading about for years but had not had the opportunity to try. 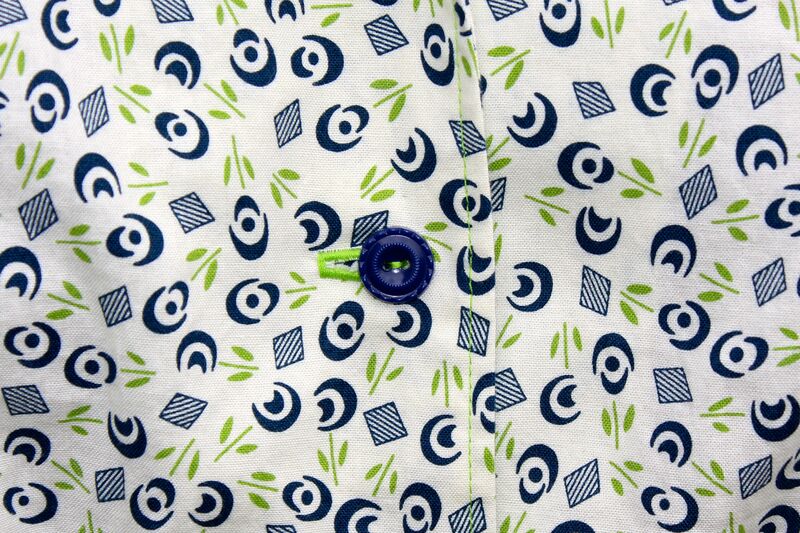 The yoke is sewn entirely by machine and then turned out. The trick is rolling up the bodice pieces before you sew. Style Arc’s website has a great explanation of the technique here. 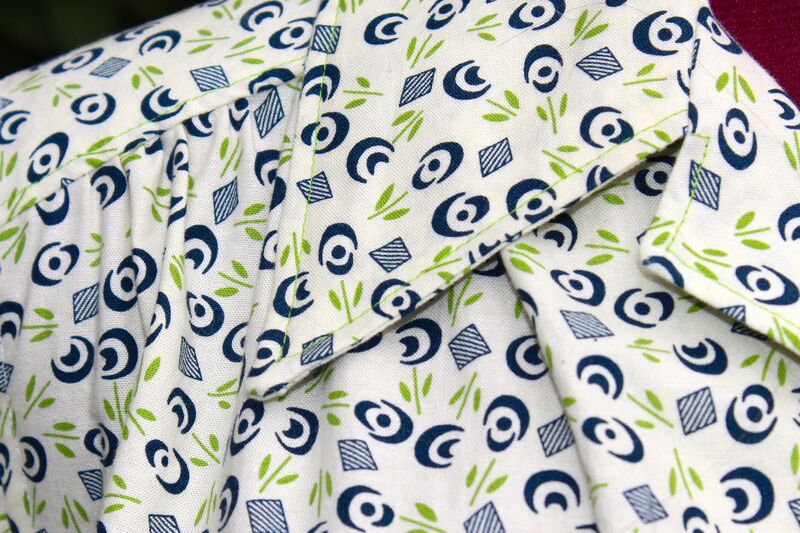 The top-stitching on the yoke is strictly decorative. And here it is on me! My new blouse. Photos by Matt Henry, the 10-year-old. I am so happy with this blouse that I eventually want to make a long-sleeve version with a white collar and cuffs. And I have the perfect fabrics in my stash. 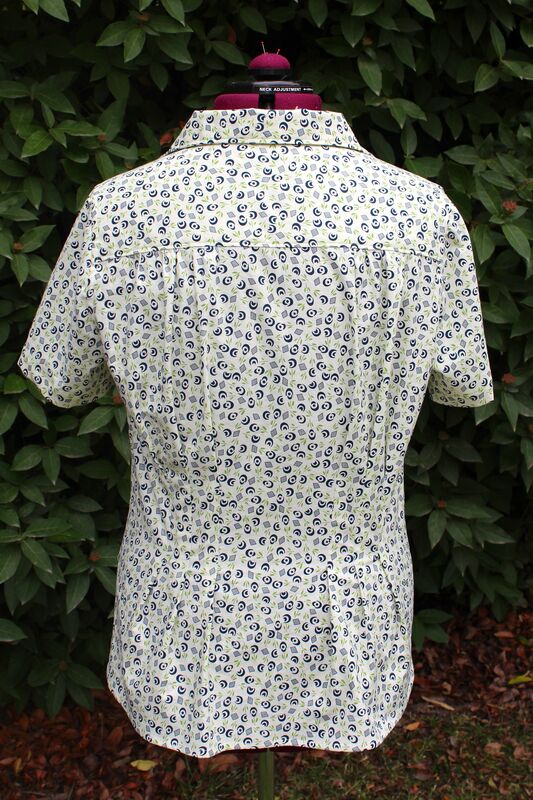 Until I find something else I like, this will be my go-to blouse pattern. It’s already fitted, so the sewing is quick. 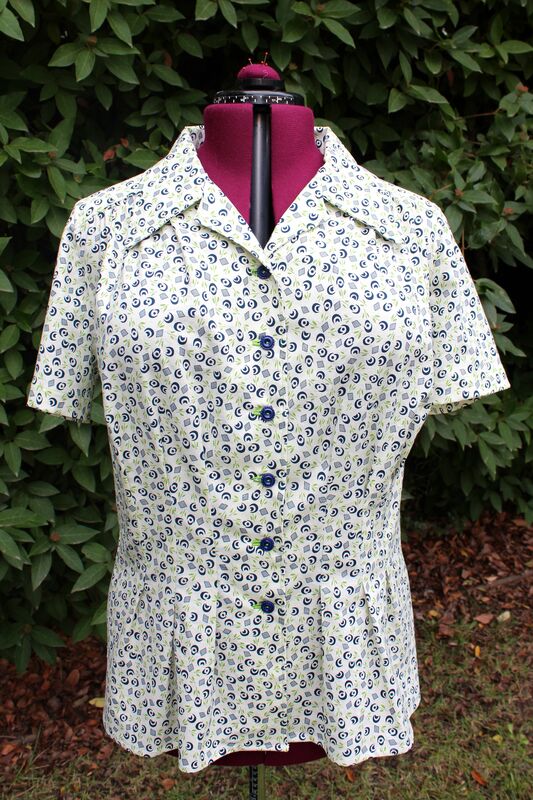 Meanwhile, I have this fab blouse and nothing vintage-style to wear with it. But I’m trying to take care of that with my next project. A muslin is underway and going well so far. I’m thinking dark blue denim. After an amazing start, and a horrifying June Swoon, the San Francisco Giants won the World Series for the third time in five years. As much as I love sewing while watching baseball games (three hours of multi-tasking! ), I canNOT sew during playoffs. Not with the way the Giants play. I’m too busy clutching a pillow. I’m so glad the season is finally over. My nerves couldn’t take much more, and I have lots of sewing to do! Wow! What an accomplished seamstress my daughter is, but I knew that you would be. Nice! The shape and length are very flattering!